resided at 54 W. Main St.
Well, Leon appears to know more about his aunt then his mother. 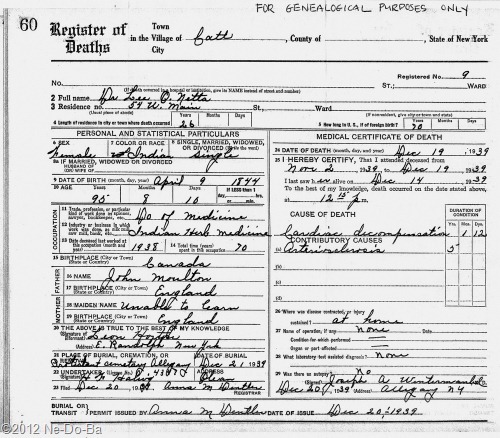 There are no parents or locations listed on his mother’s death record. Now nine years later he knows the name of the father of his mother’s sister. Shouldn’t this also be his mother’s father? Did Lee-o-netto talk to Leon about her parents after his mother passed away or was he poorly remembering a visit to the Moulton cemetery plot in Stockton? But, Leon knew his grandparents, Laton & Marleah Kanistanaux. So I guess he is telling me that neither Laton nor Marleah are the parents of Lee-o-netto. Another possibility might be that a neighbor or caretaker provided the information or the doctor collected the data while attending to Lee-o-netto. Perhaps, as next of kin, Leon was only asked to verify the data provided by a non-family member. Perhaps he didn’t actual read what he was signing. The entry for her mother is a bit curious. It does not say unknown, which is what I would expect to find here. Instead it says “unable to learn”. This suggests someone (but who?) had attempted to learn who her mother was. Did someone actually ask Nettie about her parents? Did they search her house looking for family papers? It just leaves me wondering about a lot of things. But of course I should be getting used to this family not giving up it’s secrets easily. Very curious how both parents are born in England, but she is Indian. What’s up with that? How can you be an American Indian if both parents are English? Perhaps the informant was trying to say they were from English Canada rather than from England. Canada is part of England, so technically this could be accurate. But if this is true, shouldn’t Lee-o-netto also be shown as born in England instead of Canada? Now, even though I have an official death record and it contains some real information, I have serious questions about the integrity of this information. There is no one left from the original family, so whoever provided this information could not have known it first hand (unless it was Lee-o-netto herself). So, did they really know what they were talking about? Nettie’s biography published in 1893 claims her father was Kanistanaux. I never really believed that. But, finding her father listed as John Moulton was a big surprise. It appears Lee-o-netto is probably not a Kanistanaux, even though she is listed as a sibling to two who used the surname. Does this mean that Carrie and Henry are also children of John Moulton? Just who is John Moulton? Why does it have to be such a common name? Why couldn’t he have been an Obadiah or something less common? I wonder if John is a little brother or son to Eli Moulton. If John is Eli’s son, that would make Lee-o-netto a niece of Marleah and if John is a younger brother than Marleah and Lee-o-netto would be cousins. Perhaps something happened to John causing Eli & Katie to take in the children. Later, Marleah took over for her elderly parents. It will take forever to go through and narrow down all the possible John Moultons in the world. Ah, but that’s what make genealogy so fun. Where’s the challenge of the hunt if everything is just handed to me? This lead may turn out to be a hot potato or a rotten tomato. Only time will tell, but at least I have a name to start the process.